Save big on a wide range of office, school, home office, and entertainment equipment at Dell! Our friends at Ebates have found another great deal from Dell! Check out the sale and get an additional 1 Ballot from Freebies.com, simply visit the link below, type 'Dell' in the search bar, and click on the Dell logo. Enjoy this awesome shopping trip! 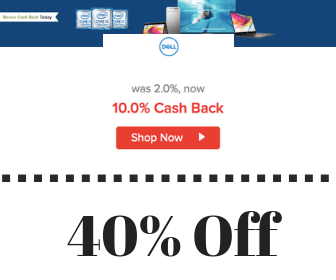 Right now, save up to 40% off at Dell, plus you'll enjoy a 10.0% Cash Back bonus through Ebates.ca. If you're not a member of Ebates, you can sign up today and get a $5 Cash bonus to go shopping! This offer expires on April 15th, 2019.